There is no denying that beauty is in the eye of the beholder and many different things can make up a person’s attractiveness.Personality, intelligence, sense of humor and style all factor in to an individual’s overall beauty; it is not all about facial structure. Besides, if we were all attracted to the same person, life would be even more of a competition than it is already. There are some people though, who are regarded as having a more conventional beauty and the reason behind it is actually more technical than it would seem. iPhone has recently added an application known as the Vanity - Beauty Monitor App that allows users to import a picture of their face and then pinpoint certain areas for calculation.The program will then use the information to determine the user’s ‘beauty’ based on the Golden Ratio.You may remember the Golden Ratio from other areas of study.The golden ratio, also known as the divine proportion, golden mean, or golden section, is a number often encountered when taking the ratios of distances in simple geometric figures. Its proportions have been used for centuries to create stunning architecture and artwork, but it can be found throughout nature including human faces. 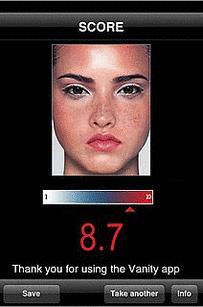 The closer a person’s features match the ideal proportions, the more conventionally attractive they are. Our guest blogger, Kim Patterson, is a freelance writer and stay at home mom of a busy toddler. How "Mickey Mouse" Is Re-Branding? You have to hold your face in a very specific pose for The Phi Mask to work, though.